This terracotta/pink, a classic granny chic colour, has become so ingrained in my head that I am subconsciously buying everything (from plates to sunglasses and jumpers) in the same or varying shades, weird!!. You might think this is just me talking about a sort of blush pink colour again, but in fact it's rather different to the blush pinks you're seeing out there at the moment. There is definitely more of a brown hue to it (more brown than blush) and it's deeper and darker and crucially more earthy than blush. To give you the idea check out these looks below which all feature this colour but in different tones and shades. We are using this colour just in our alcoves but it would be gorgeous as a full wall colour too. This is an old antique book I bought at an auction a few months ago - I shot it wearing a gold necklace as I think the gold just works so well with that terracotta colour as inspiration. See what I mean about being totally obsessed with this colour! This is an old garage door on an industrial estate in Battersea that caught my eye and I just love the strip effect of the door. If you're in love with this colour as much as I am then check out these gorgeous paint colours from Farrow & Ball - I love the "Cinder Rose" and "Book Room Red" which are I guess most true to the earthy pinks and terracottas I've mentioned above. 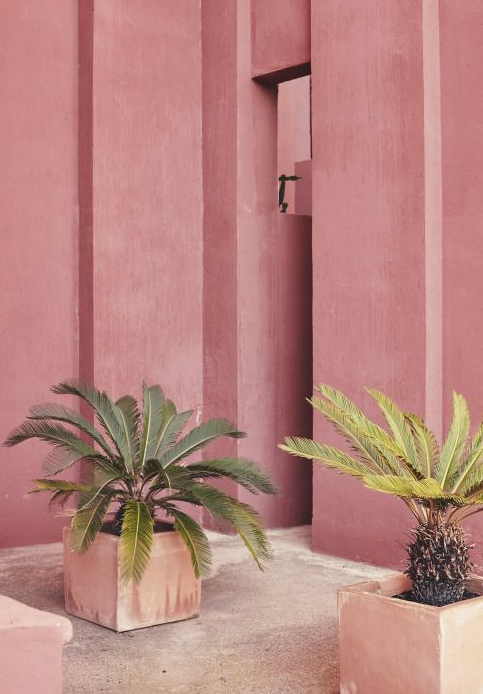 So what do you think of these earthy pinks and terracotta colours? Where do you think these might work in your home?